Designed as a cleansing meal-replacement regimen, we offer a tailored cold-pressed juice program that promotes beauty and health. 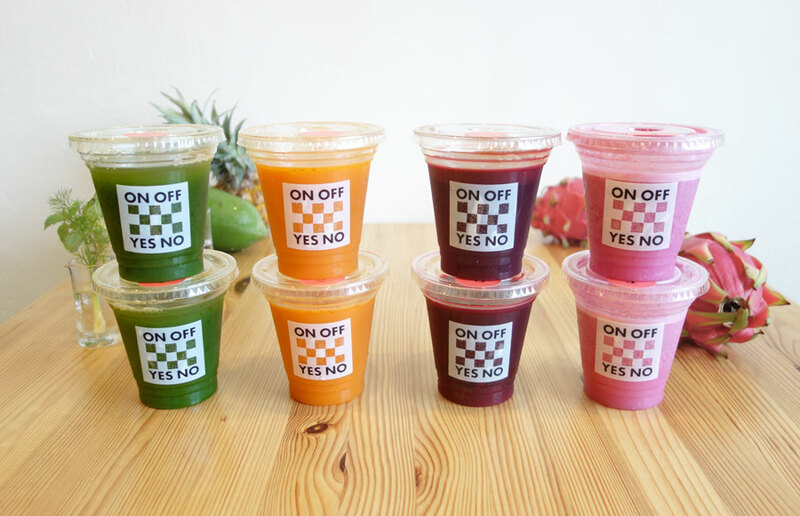 Developed utilizing carefully selected material with our registered dietician, ON OFF YES NO’s original juicing recipe is a great approach to a safe and gentle cleanse. Click here for the A4 sized leaflet. Not offered as a by-mail program, we encourage members to stop by the shop once a day to receive their juice. ※ Picture is the example of one day’s juice portion. ※ Containers are subject to change without prior notification. Homemade Almond Milk Dragon Fruit etc. ※ 8 cups for Day 1 and 10 cups for Day 2. Homemade Almond Milk Wheatgrass etc. Seasonal Greens/ Herbs Ginger etc. Tomato Pineapple Raw Pomegranate Powder etc. Black Carrot Activated Charcoal etc. Seasonal Citrus Raw Spirulina etc. Homemade Almond Milk Raw Cacao Powder etc. Seasonal Greens/ Herbs Seasonal Citrus etc. Reservation form is closed at this moment. Please read carefully before making reservations. 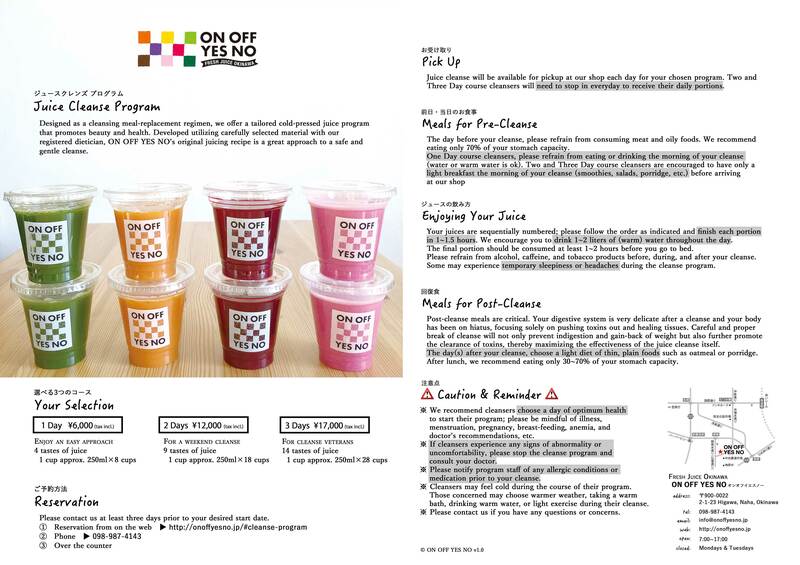 Juice cleanse will be available for pickup at our shop each day for your chosen program . Two and Three Day course cleansers will need to stop in everyday to receive their daily portions. The day before your cleanse, please refrain from consuming meat and oily foods . We recommend eating only 70% of your stomach capacity. One Day course cleansers, please refrain from eating or drinking the morning of your cleanse (water or warm water is ok). Two and Three Day course cleansers are encouraged to have only a light breakfast the morning of your cleanse (smoothies, salads, porridge, etc.) before arriving at our shop. Your juices are sequentially numbered; please follow the order as indicated and finish each portion in 1~1.5 hours . We encourage you to drink 1~2 liters of (warm) water throughout the day . The final portion should be consumed at least 1~2 hours before you go to bed. Please refrain from alcohol, caffeine, and tobacco products before, during, and after your cleanse. Some may experience temporary sleepiness or headaches during the cleanse program. Post-cleanse meals are critical. Your digestive system is very delicate after a cleanse and your body has been on hiatus, focusing solely on pushing toxins out and healing tissues. Careful and proper break of cleanse will not only prevent indigestion and gain-back of weight but also further promote the clearance of toxins, thereby maximizing the effectiveness of the juice cleanse itself. The day(s) after your cleanse, choose a light diet of thin, plain foods such as oatmeal or porridge . After lunch, we recommend eating only 30~70% of your stomach capacity. ※ We recommend cleansers choose a day of optimum health to start their program; please be mindful of illness, menstruation, pregnancy, breast-feeding, anemia, and doctor’s recommendations, etc. ※ If cleansers experience any signs of abnormality or uncomfortability, please stop the cleanse program and consult your doctor. ※ Please notify program staff of any allergic conditions or medication prior to your cleanse . ※ Cleansers may feel cold during the course of their program. Those concerned may choose warmer weather, taking a warm bath, drinking warm water, or light exercise during their cleanse. ※ Please contact us if you have any questions or concerns.